Crispy, tender, flakey salmon, served on a heaping pile of fresh greens and veggies, topped off with toasted pine nuts and crumbled feta. 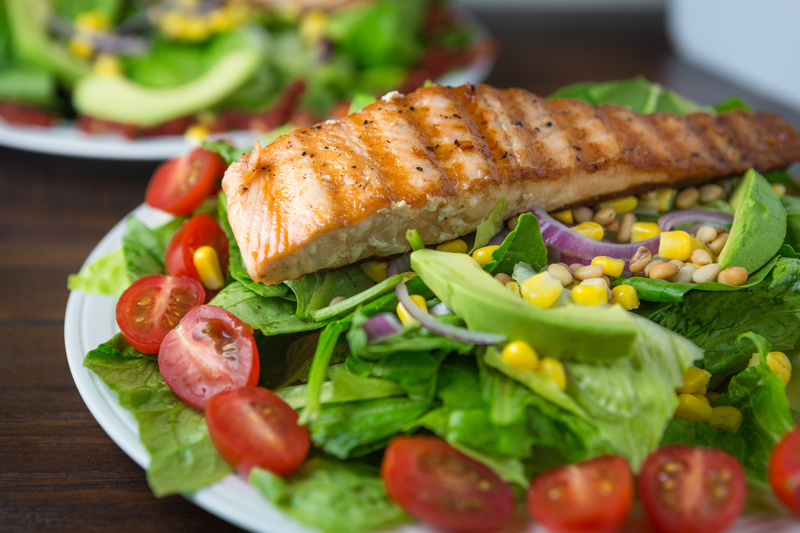 Pan Seared Salmon Salad is the perfect combination of succulent flavors, summer freshness and heart-healthy fats and protein. I hope you had a great week! It was sure a fun, and busy one around here. The humongous rainstorm that happened Monday afternoon, left our entire area in a state of disaster on Tuesday. Most of the local freeways were shutdown and thousands of basements were flooded. What a mess! 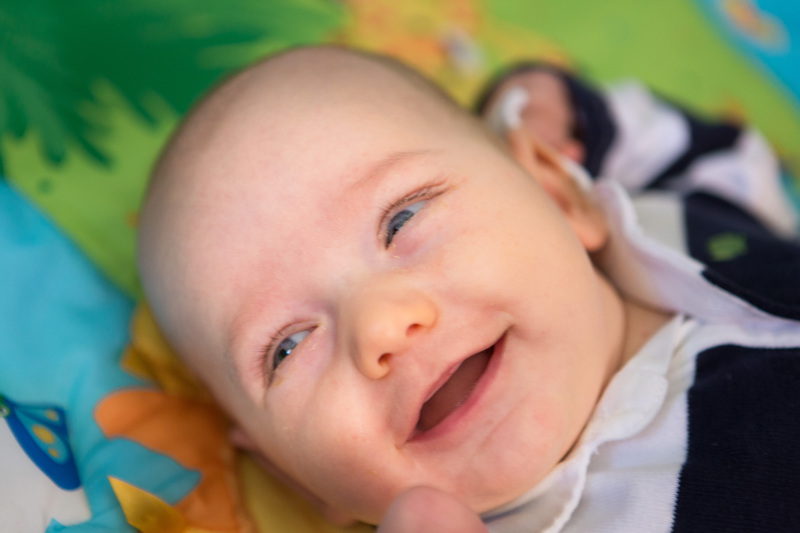 We stayed close to home that day, and enjoyed a great playdate with some very sweet friends from out-of-town. In the afternoon, we had another special visit with another wonderful friend that I haven’t seen in over 10 years! Tuesday was a great reminder for me to be thankful for all of the amazing people that are in our lives. Now that you’ve taken a look at our weekend, here’s a little background on what first inspired me to make this recipe. On our recent San Diego Trip 2014, Andrew and I discovered a fabulous little restaurant, Harry’s Bar and American Grill, that was right around the corner from our hotel. We ate there for the first time on our date night. (Thanks to my wonderful Aunt Janie, for coming to our hotel to babysit while Andrew and I enjoyed a quiet, adult dinner out. WHAT A GIFT :)) We enjoyed our meal so much that we even went back later in the week. 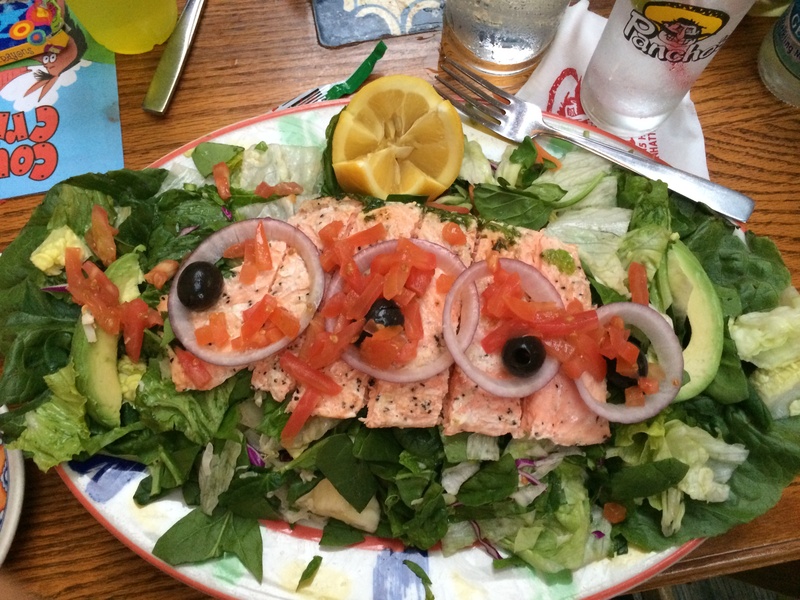 Call it a pregnancy craving, followed by our latest obsession, but ever since our venture out to the West Coast, salmon salads have been the latest craze in our house. 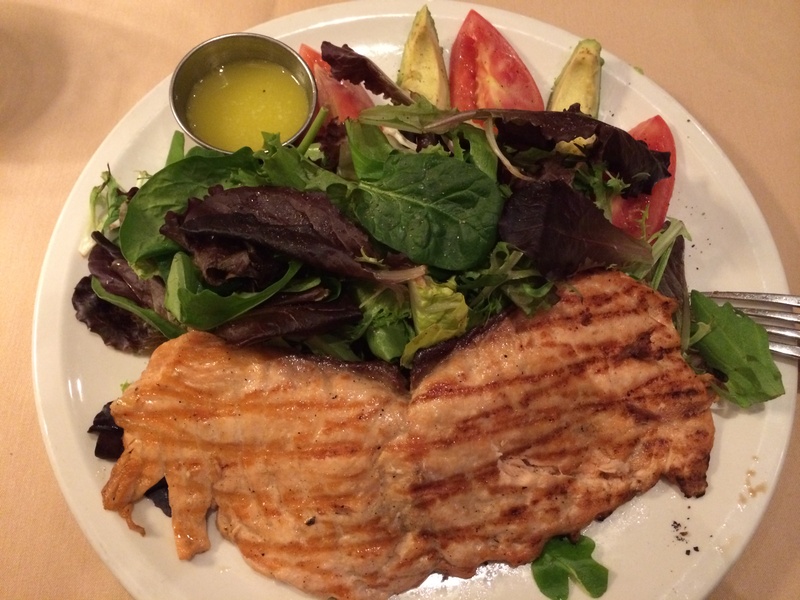 The picture on the left is the salmon salad at Harry’s, and the one on the right is from Pancho’s Restaurant in Los Angeles. Yum! Here are a few candid pictures from our Pan Seared Salmon Salad nights at home. 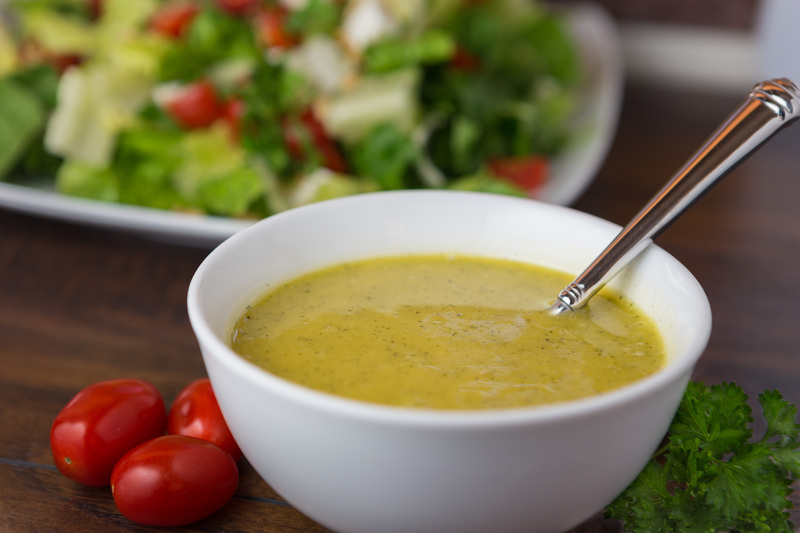 This salad is best with this Creamy Balsamic Dressing. 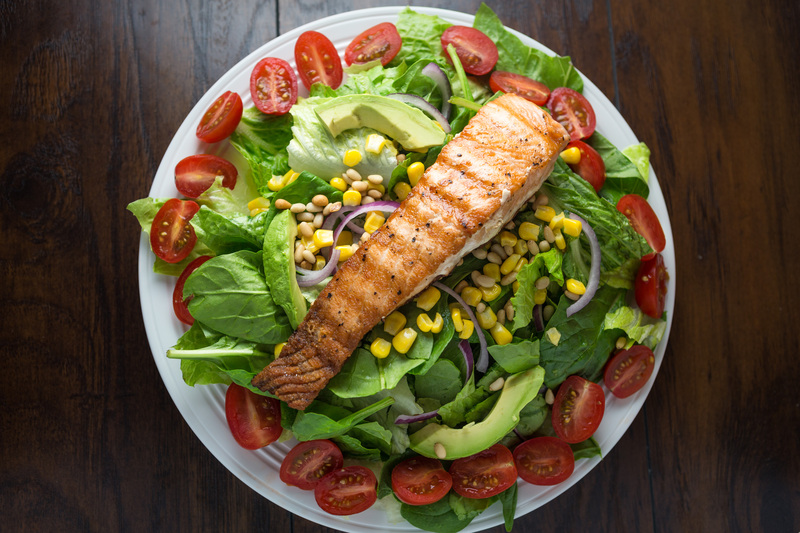 It’s no wonder that this Pan Seared Salmon Salad has become an all-around crowd pleaser in our family. It’s easy, delicious, and loved by our whole family! Cover and refrigerate dressing until ready to use. Divide lettuce and spinach between plates. Then top with tomatoes, avocado, onion, corn, pine nuts, and feta. Set aside. Pat salmon dry with paper towels, and season both sides with salt. Add 2 teaspoons oil to a large, nonstick skillet or grill pan, over medium-high heat. When pan is hot, add salmon and cook for about 3 to 4 minutes on one side. Carefully, flip salmon over and cook for 3 to 4 minutes more, or until salmon is crispy on the outside and the interior is cooked through. Let salmon rest in pan for 1 to 2 minutes, then add salmon to plated salads, drizzle with Creamy Balsamic Dressing and serve. Dressing will keep covered and refrigerated for one week. Marinated, ground chicken, tender mushrooms, and crunchy water chestnuts, sautéed together in a flavorful sauce. 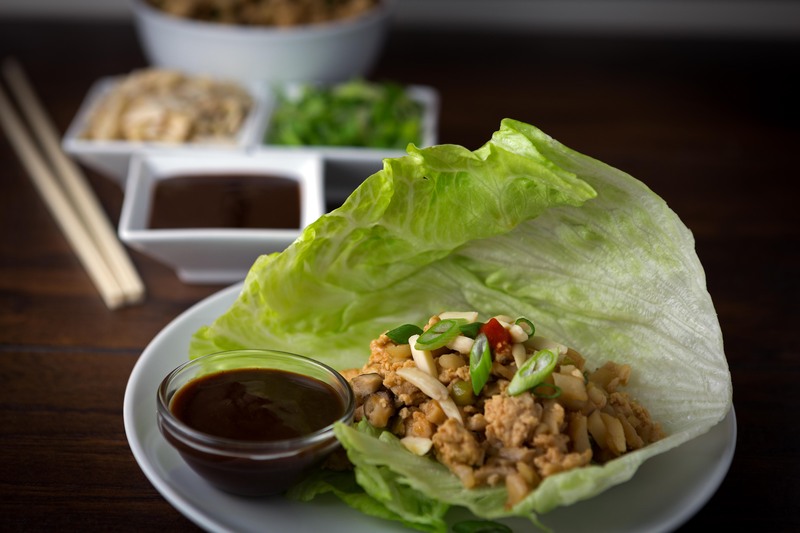 These Light Chicken Lettuce Wraps are served inside fresh, crispy lettuce leaves, topped with slivered almonds, scallions, and a mouthwatering hoisin dipping sauce. Happy Sunday! If you missed my other post from earlier this week, be sure to check out pictures from our trip to Rome and my recipe for Pasta with Tomatoes, Basil and Fresh Mozzarella. 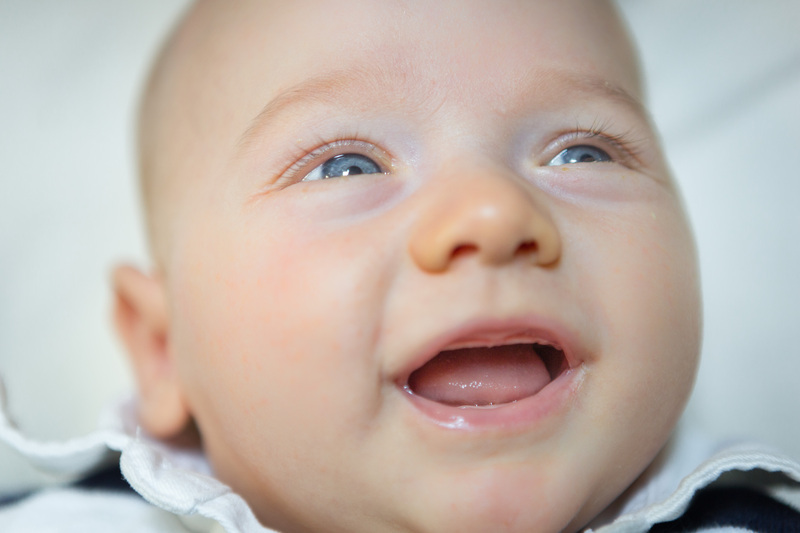 I hope you had a great weekend like we did. Yesterday’s fishing rodeo was of course the highlight for us! What a fantastic little event put on by our community. The boys had such a BLAST! They loved fishing, the midmorning donut snack, getting to pick out a prize, and the whole experience in general. 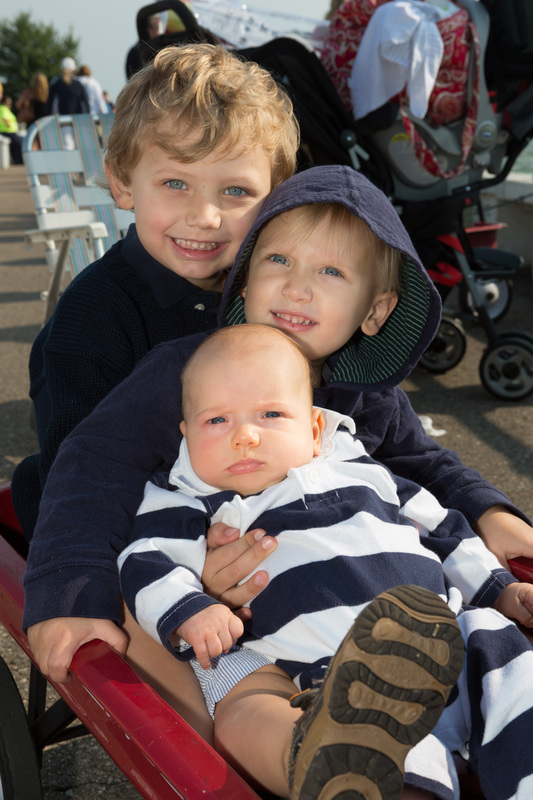 Here are some of our favorite pictures from our time at the pier. These Light Chicken Lettuce Wraps have quickly moved to the top of our favorite recipes. This is one dish that I am super excited to share! You will definitely want to add these tender, tasty, delightfully refreshing lettuce wraps to your menu this week! The first lettuce wraps that Andrew and I ever tasted were the chicken lettuce wraps at P.F. Chang’s. They are quite good, and are clearly a popular item on their menu. The last time we had them was on our San Diego Trip 2014. We even had to get a second order because we had no idea the boys would like them so much. However, my biggest gripe with them is that they are SO greasy! I mean for something that sounds healthy, they actually aren’t. They nailed the flavor, but with all the added salt, fat, and tons of chemicals, I guess it’s a no brainer that there’s some room for improvement. The other example for this recipe came from our local favorite Chinese restaurant, Golden Chopsticks. Their lettuce wraps are also very good! They are a lot less greasy than P.F. Chang’s, but the hunt was still on for the perfect lettuce wrap. With the flavors of inspiration dangling in my head, I knew that I just had to figure out my own version of chicken lettuce wraps. I spent a lot of time researching and testing this one! I used some ideas from America’s Test Kitchen’s Chinese Chicken Lettuce Wraps as my foundation for this recipe, and then followed my own instincts and trial and error from there. I wanted to give the hoisin dipping sauce a little kick, and slightly modified this Spicy Hoisin Dipping Sauce in my recipe. Additions, subtractions, and multiple versions. I tried to take everything I liked about both of my favorites, leave out the things I didn’t, and voila! May I present to you, Light Chicken Lettuce Wraps. Easy enough for a week night, fancy enough for a special occasion, and impressive enough for company. 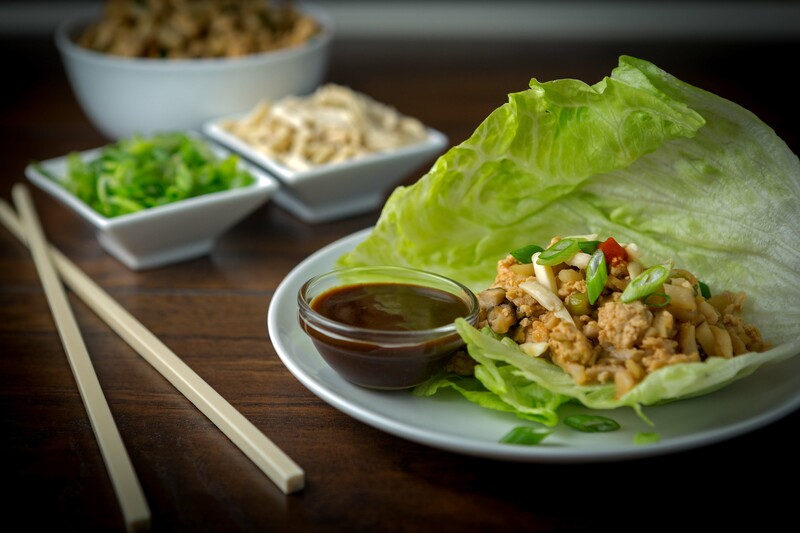 When you’re craving that “take-out fix”, but don’t want to go out, these Light Chicken Lettuce Wraps are just what you’re looking for! Cut each breast into 4 pieces. Place 6-8 chicken pieces into food processor at a time, and pulse until chicken resembles very fine, minced pieces. Scrape chicken into a clean bowl and set aside. In a small bowl, combine ingredients for the marinade: cornstarch, sesame oil, rice vinegar, and soy sauce, and whisk together. Pour marinade over chicken and mix together until chicken is well-coated. Cover and refrigerate for at least 20 minutes or up to two hours. While chicken is marinating, in a small, heat-proof bowl, add dried mushrooms and add enough boiling water to fully cover them. Allow mushrooms to sit for 20 minutes. Drain mushrooms from water and press out additional water. Place mushrooms on a cutting board and dice. Set aside. In a small bowl, combine ingredients for stir-fry sauce: oyster sauce, hoisin, water, sesame oil, soy sauce, rice vinegar, honey, and Sriracha, and whisk together, and set aside. Combine ingredients for hoisin dipping sauce in a tiny bowl: hoisin, Sriracha, and water, and stir together. Set aside for serving. In a large, nonstick frying pan, heat 1 teaspoon canola oil over medium heat. Add chicken and cook for about 5 to 6 minutes, stirring and breaking up chicken while cooking, until chicken is cooked through. After cooking, move chicken to a clean bowl. Using the same pan, (not cleaned) heat an additional teaspoon of canola oil. When hot, add mushrooms and stir, cook for about 2 minutes. Then stir in garlic, scallions, and water chestnuts, and cook for 2 more minutes. Add the marinated chicken and stir-fry sauce (stir sauce again right before adding to pan), and mix together, until combined. Cook for about 1 to 2 more minutes, until all ingredients are hot. Remove from heat. To serve, place about 1/4 cup of chicken onto a piece of lettuce. Top with scallions, slivered almonds, and a small spoonful of hoisin dipping sauce. Repeat! To make these more filling as an entree, serve with a side of white or brown rice, or even add a small scoop of rice to each lettuce wrap.